Vulcan Materials (NYSE:VMC) ranks second with a gain of 17.49%, followed by Akamai Tech (NASDAQ:AKAM), Newfield Exploration (NYSE:NFX), and Twitter (NYSE:TWTR). 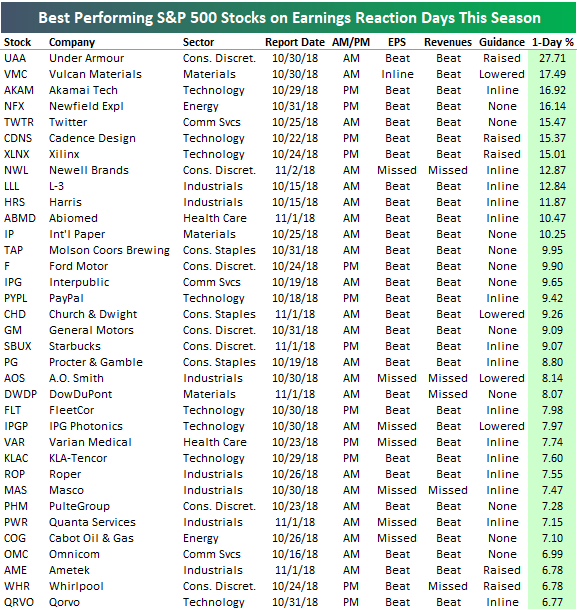 Other notables on the list of big winners this earnings season include International Paper (NYSE:IP), Ford (NYSE:F), PayPal (NASDAQ:PYPL), Church & Dwight (NYSE:CHD), Starbucks (NASDAQ:SBUX), General Motors (NYSE:GM), Procter & Gamble (NYSE:PG), DowDuPont (NYSE:DWDP), and Whirlpool (NYSE:WHR). These certainly aren’t your typical high-fliers! 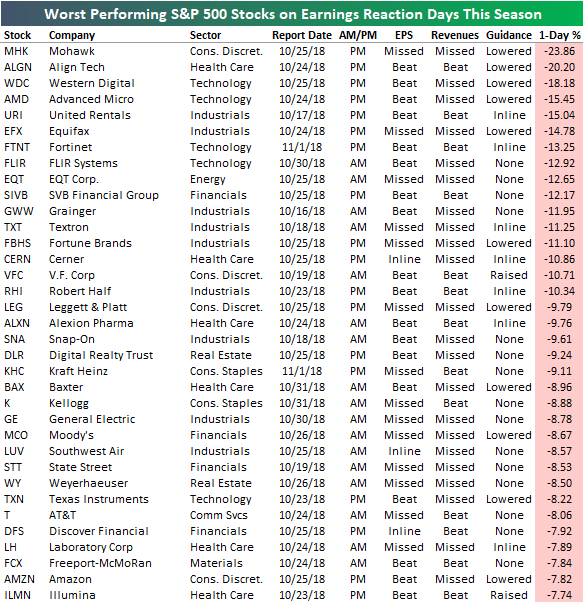 On the downside, Mohawk (NYSE:MHK) has been the worst performer this earnings season with a one-day decline of 23.86% after it reported a reverse triple play on October 25th. The stock missed EPS estimates, missed revenue estimates, and lowered guidance. Align Technology (NASDAQ:ALGN) ranks second worst with a one-day decline of 20.2%, followed by Western Digital (NYSE:WDC), Advanced Micro (NASDAQ:AMD), and United Rentals (NYSE:URI). Other notables on the list of losers include Equifax (NYSE:EFX), Fortinet (NASDAQ:FTNT) (not to be confused with the video game Fortnite! ), Fortune Brands (NYSE:FBHS), Kraft Heinz (NASDAQ:KHC), Kellogg (NYSE:K), General Electric (NYSE:GE), AT&T (NYSE:T), and Amazon (NASDAQ:AMZN).